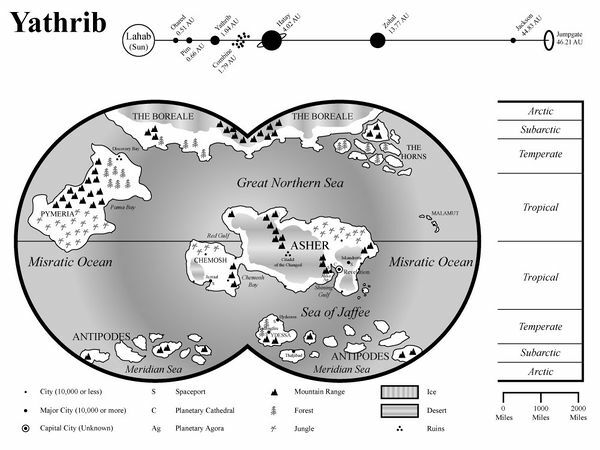 Difference between revisions of "Imperial Survey: Yathrib"
Early in the Diapsora, Captain Henry Pym of the Pan Arabian Mercantile Alliance - PAMA - discovered a dusty, habitable world one jump away from Aylon. PAMA's pilots were among the best explorers in the waning days of the First Republic, but the zaibatsu sold most of its discovered systems to other corporations, retaining for itself only out-of-the-way worlds with few resources. At the time, PAMA's rivals laughed - the richest rewards were in colonization and exploitation, not exploration and discovery - but they were not privy to the true agenda that underlay PAMA's discoveries. Unbeknownst to even the senior management of the zaibatsu, the line pilots who made up PAMA's ranks were riddled with Sathraists, and they subtly wormed their way into the heart of PAMA's decision-making - seeking refuges for their dark religion, places where they could base their cults away from prying eyes. Yathrib - like Mazdak, later linked to it in history - was once such world, and the PAMA colony at Discovery Bay on the northeastern continent of Pymeria became a haven for Sathraists that would last nearly fifteen hundred years. His first sermon was given only to Saint Paulus, and then - together - they left Yathrib without returning to any town or village, bound for Aylon where the Prophet would begin to preach. He never returned to Yathrib in his lifetime, though pilgrims began to come soon after he began preaching - and so did the zaibatsu and the nobility, fearful of what the Prophet's message. Even as pilgrims flocked to sites the Prophet is said to have visited during his time on the planet, like the shrine at Leon where a lion knelt to Zebulon or the ford in the River of Joy where he is said to have bathed fearful magnates sent men-at-arms to Yathrib to stomp out this banned religion. Several early martyrs were killed during those early years, often at the hands of PAMA, who were particularly afraid that this new attention on Yathrib would draw attention to their Sathraism. The Ukar Wars changed all those equations, however. One jump from Aylon, Yathrib was far too near to Ukar Space, and the Ukari warlords feared the influence of the new religion spreading among the humans. They struck Yathrib in 2855 as part of their initial surprise assault on humanity, and held onto the world for "Forty Years of Night" until a human fleet was able to force its way past Aylon and liberate the holy world in a ten-year crusade from 2895 until 2994. While the Church tried to moderate the increasing commercialism, many bishops became coopted against their better natures. Most Holy Archbishop Alexander the Builder was perhaps the epitome of this; while all agree he had the faith at heart, he opened Yathrib up to commercial sponsorship in order to expand the starport at Pilgrim's Landing and build new two vast new ports. The first, Alexandrun, was at the White Oasis, linked by almost dozen monorails to the holy city, while the second was a floating 'Saint Paulus' Port' modeled after New Istanbul's Port Authority anchored in the Shining Gulf south of Tyche. At first, the Sathraists seem to be winning; with the Known Worlds distracted by fighting everywhere, communication was cut-off and the weakened Church had few allies. Then, however, a few brave knights began to fight back. Led by Sir Godfrey de Moley and Sir Malcolm Xavier Justinian, this ragtag brotherhood swore an oath to keep the pilgrim roads open in 4053. Gathering like-minded warriors to their holy cause, they began to beat the Sathraists back, and over the course of the next several decades they cleansed the skies and established a beachhead on Yathrib around the Holy City of Revelation. The Apocalyptic See gave Saint Godfrey - leader of the brotherhood - title as Guardian of the Holy City, and he set to reclaiming the lands around the Shining Gulf from the chaos. The final battle for the Prophet's world took place in space, and at the conclusion of the fight the Brother Battle turned their space cruiser's guns on Discovery Bay, the Sathraist stronghold. In 4073, they plague-bombing it into oblivion. Even now, the ghosts of those ancient toxins make Discovery Bay a poisoned, unsafe place filled with a dozen different ill humors. Even as the bombs began to fall, the Brother Battle pursued the Sathraists to Mazdak, where Saint Malcolm was killed and Saint Godfrey maimed. Count Jackson became the new leader of the order, while Saint Godfrey returned to Yathrib to rule as Master of Akko and Guardian of the Holy City. With most of the Brother Battle having relocated to Mazdak, the order drew back and fortified their citadel on the Mount of Apples in Akko. The Guardianship passed into noble hands in the person of Saint Godfrey's sister's son Baldwin de Moley, who left the Brother Battle so that he could marry Margaret Justinian, Saint Malcolm's cousin and another former knight of the order. As Guardian, Baldwin leads a coalition of nobles and priests to restore order, dying finally as an old man in campaigns to put down rebels. His son completed the task, and by 4211 Baldwin II was an old man ruling as first among equals over a loose coalition of nobles and priests. Besides Baldwin's minor House De Moley, two of the Ten emerged with prominence from the chaos: House Justinian, many of its members drawn to Yathrib by faith, firmly entrenched in Alexandrun and the Shining Gulf, and House al-Malik, rising to rulership in the Antipodes by virtue of long and close association with Aylon. Houses Windsor, Gesar, Hawkwood and Hazat had lesser roles in the Pearl Cities, while the minor houses Dextrite and Masseri converted to the faith of the Sathraist Kingdoms. Further conquests followed; now ensconced at Alexandrun (Iskandretta, in the Kurgan tongue) the Kurgans sent expeditions first to the Boreale and then to the Antipodes, sweeping away the few defenders in the former and fighting a short but bloody conflict in the the latter until the al-Malik count of Hydessos struck the Peace of Edessa, in which the Antipodes would pay tribute to the Kurgans but be allowed to keep their faith. The greatest of the Halaba Wars, of course, was fought over Revelation, which beat back three sieges in 4892, 4908, and 4919 until the Kurgans were able to bring orbital bombardment to bear in 4924. After the ensuing evacuation, the remnant Known Worlders began to shell back in a continuous set of wars broken only briefly by the Peace at the River of Joy, which created five refugee camps for those who had been driven out of the Holy City and set guidelines for their administration. When Joscelin's Crusade emerged back in Yathrib space, Akko was in dire straights: Jalalkan's host was at the gates of Akko, and it seemed that the last days of faith on Yathrib had come. Joscelin's forces fell upon the Kurgans from space, and Count Joscelin himself fought hand to hand with Jalalkan. The Kurgan general struck him down, but the crusaders won the day, pushing the Kurgans back over the River of Joy. '''Hatay:''' Lahab's largest planet, Hatay is a giant blue-green gas giant with over a hundred moons. During the Second Republic, the moons were heavily terraformed and sold as individual estates to the ultra-wealthy. Called "The Jewels of Hatay", these moons are now the scene of continuous battle between Imperial and Kurgan forces; indeed, some of the smallest moons have been artificially brought so close together that marauders can literally leap from one to another. The Kurgan Sultan of Hatay claims all of the Jewels from his palace on the emerald moon of Rinkopi, while the ancient Imperial dreadnaught 'Acropolis' has been permanently moored at the Coral Roads. The Roads are not far from one end of the Strait of Antioch, and they serve as a sort of base and staging-ground for Charioteer and crusader caravans headed to the inner system. '''Zohal:''' Sometimes called 'The Black World', Zohal is a gas giant with an unusually low albedo and a series of narrow, icy rings with a dozen or so moons. Its purple-black clouds inspired early explorers, who established a way-station on its largest moon, but by the Second Republic faster starships left it a backwater. The Kurgan Caliphate has recolonized the sixth moon to serve as a fleet base. '''Zohal:''' Sometimes called 'The Black World', Zohal is a gas giant with an unusually low albedo and a series of narrow, icy rings with a dozen or so moons. Its purple-black clouds inspired early explorers, who established a way-station on its largest moon, but by the Second Republic's faster starships left it a backwater. The Kurgan Caliphate has recolonized the sixth moon to serve as a fleet base. '''Jackson:''' A small rock planet near the jumpgate, Jackson's surface is scarred and pitted by comets. Xenoarchaeologists speculate that it may have been artificially moved to its present orbit to serve as a staging ground for the construction of the jumpgate, though impacts have obscured any ruins that might remain. The Kurgans had a listening post at Jackson prior to the crusades; since then, neither the Caliphate or the Known Worlds have been able to keep a foothold. The heart of the Foregate is the Spice Market, the de facto planetary agora since the fall of the Holy City. The Spice Market is an enormous bazaar just outside the Old City's gates, filled with a profusion of stalls and sellers. Running east from the market is a broad main avenue called the Drag which runs to the Quayside district, while Vaal Street runs south from the market to the stockyards and the county of Johburg beyond. Most of the Foregate is solidly middle- and working-class; it tends to be wealthier as it gets inland and poorer towards the coast. The Quayside itself is dominated by the enormous concrete New Pier, sticking out in the ocean nearly a half mile to allow the great passenger liners of eons pass to dock. Not far inland along the Drag is the infamous Club Jehan, a warehouse converted to a sort of nightclub popular among disaffected nobles and wealthy guilders. The Temple Avesti are always seeking to shut the club down, but so far its Scraver proprietors have kept it open. Still, Count Walker has excellent cellars and is a gracious host. His grand-daughter Emilie was particularly kind to me, though when I told Count Walker my father renounced my family's place in the line of succession I suddenly saw much less of her. Hunting with the Count the next day I was instead subjected to grilling about the Emperor's court, with particular attention paid to his unmarried status. Zelah sits in the center of a string of five cities. North of it is Gilead, a pleasant city now notorious for its new ruler. After the Betrayal, Lord Rutger Mortimer was rewarded with Gilead as his prize, and everyone says that his palace is the site of many infamies. North still is Asshur, nestled between the mountains and the sea. Edom was the last of the Pearl Cities to hold out during the Halaba Wars, and it was from here that Count Tengri Gesar masterminded his defense of the Pearls. His descendants still rule as the al-Gesar; Chagatai al-Gesar, the current Khan of Asshur, is said to be a faithful subject of the Kurgan Caliph as well as a terrifyingly effective commander. Because Asshur was never taken, it remains one of the strongest of the Pearl Cities and its cavalry regularly sees combat around Revelation.